"Where can I camp on the PCT?" This is one of the most common questions asked by aspiring PCT hikers. The good news is, you can camp practically anywhere. All Forest Service and wilderness lands the PCT crosses in Oregon are public land, and thus open to camping. The more challenging places to camp come in the regulated areas (see below), as well as some BLM and private lands—but those are few and far between. In a nutshell, you have no shortage of camping options available. In the guidebook, Hiking the Pacific Crest Trail: Oregon, there are nearly 200 camp locations indicated on or near the PCT. This includes frontcountry campgrounds, popular backcountry camp areas and already-impacted primitive sites. Each of these camps were selected for their logistical advantages, proximity to water, scenic views and convenience. This is intended to help take the guesswork out of figuring out where to throw down your tent each night, and help you anticipate daily destinations. It can also provide you with alternative options in case you want to push on farther than your original plan, or give you suggestions if you happen to run out of gas and need to crash earlier than expected. Along the PCT thru Oregon, there are more than 60 “established” camp areas. These are mostly named sites and are recommended as choice destinations. Many of these are frontcountry campgrounds, managed by national forests, parks or private entities. 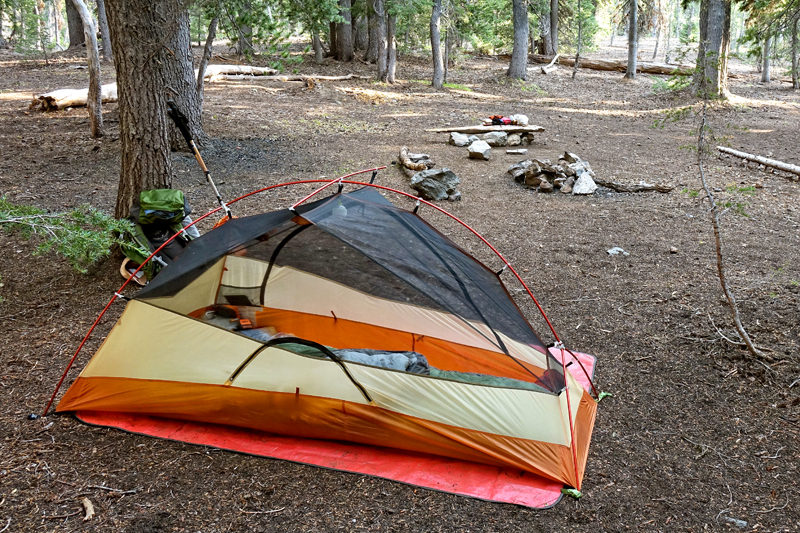 The advantage to these locations is that they often offer conveniences, such as tent sites, fire pits, drinking water, restrooms and trash facilities. Some of them are adjacent to some of Oregon’s mountain resorts and let you take advantage of other amenities such as dining, resupplying, showers and laundry. Most of these locations charge a nominal nightly fee. In addition to the large, frontcountry camp areas, there are also a number of established backcountry locations. These are ideal for their ability to accommodate multiple hikers and/or groups. These are often larger camp areas near trailheads or water; some have fire pits and rocks and logs for sitting. Many of these are on or near lakes, so there’s opportunities for kicking back lakeside or taking a refreshing dip. 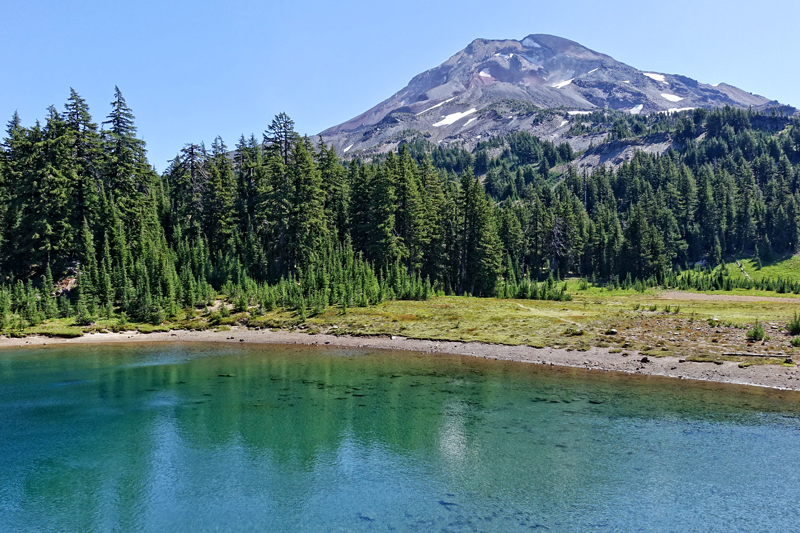 You will find multiple options for well-established front- and backcountry camp locations in each of Oregon’s PCT sections, and most will have reliable availability. There are also a number of “primitive” sites along the PCT in Oregon. These sites are typically deeper in the backcountry, away from trailheads, and offer more solitude than the larger, busier camp locations. They are often smaller as well, and only able to accommodate one or two tents. These sites are selected for their proximity to water or exceptional views; some have fire rings and logs for sitting. In the guidebook, Hiking the Pacific Crest Trail: Oregon, these locations are numbered and are well-used by hikers. Many of these sites, while not recommended as primary destinations, make good second-choice locations. After all, while some are great sites, someone may beat you to the punch. It’s a good idea to have a couple backup options in case you roll into one of these locations and find it already occupied. Additionally, there are countless “secret” campsites near the PCT. These sites are not included in the guidebook as they may be in sensitive areas or require some off-trail navigation. These are often treasures to find, as most of them are in especially scenic areas. If you’re feeling adventurous, you may have fun searching for one of these—just be sure you can find your way back to the PCT. And of course, you can always make your own primitive camp (see Leave No Trace). Just about any flat spot will do. Not every flat spot is the most scenic or convenient, but when you’re in a pinch, you can usually find something. 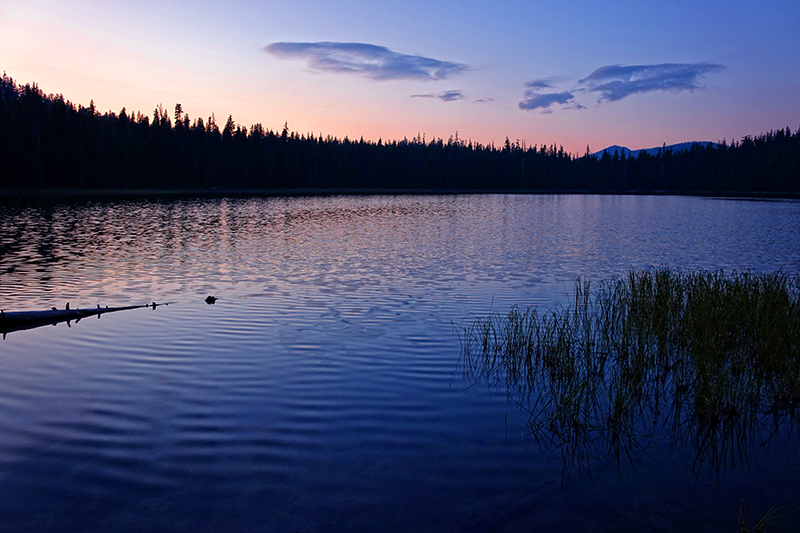 You can obtain a backcountry camping permit for Crater Lake in person at the park. Permits for the two LEA areas are available online prior to your trip (see PCT Permits). In a few small areas in southern Oregon where the PCT crosses private land, camping is prohibited. The good news is that these sections are short and not ideal for camping anyway. Good campsite near the Muddy Fork crossing in the Mt. Hood Wilderness. Camping at Grouse Hill in Crater Lake Nat'l Park. A nice view of South and Middle Sister from Reese Lake Camp. A colorful sunset from camp at Maidu Lake in the Mt. Thielsen Wilderness. 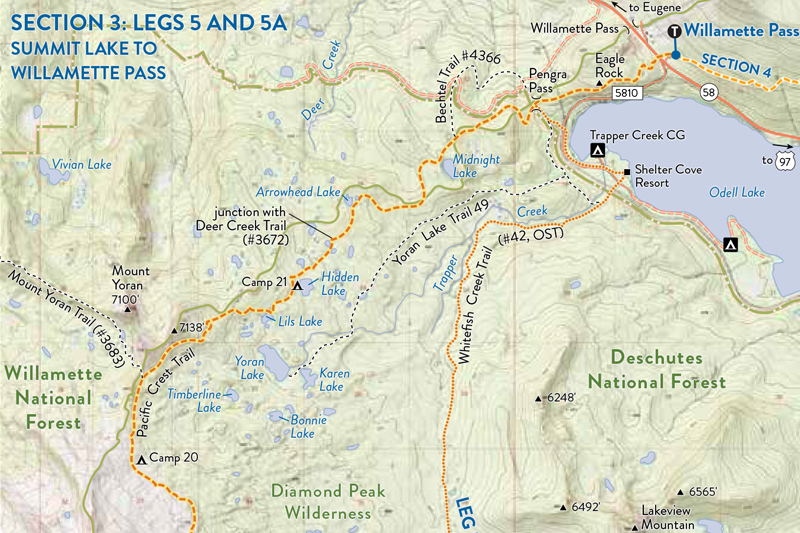 Plan your hike with guidebook maps showing the location of PCT camp areas. The suggested guideline for camping on or near the PCT is to follow LNT principles and camp at least 100 feet from trail and water. This should definitely be practiced when making your own primitive campsites. The ideal is to choose camp areas on durable surfaces (duff, dirt, sand, rock, snow) and keep your footprint minimal. Areas to avoid camping on are sensitive meadows, alpine vegetation and riparian areas. When you depart, clean up and brush away any trace that you were there. 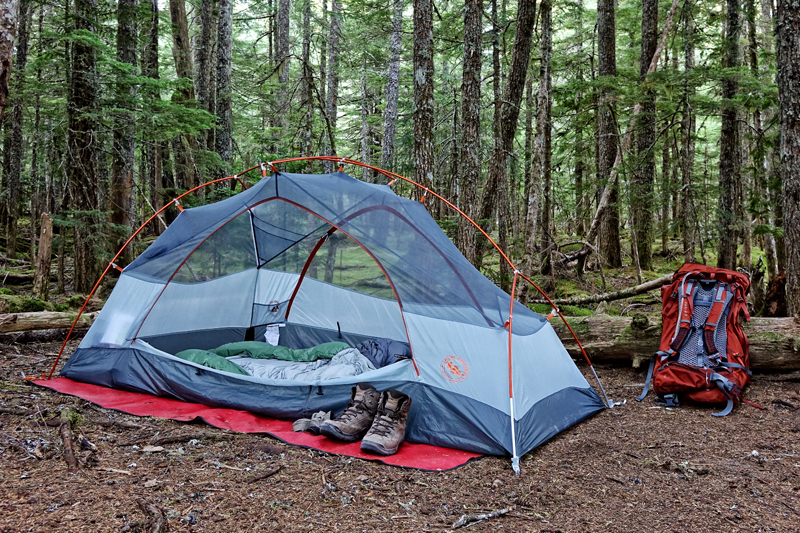 When it comes to established and well-used campsites, this is where LNT enters a gray area. Many of these sites are closer than 100 feet to trail and water and this is acceptable. This helps keep impact concentrated in specific areas rather than spreading it around. The forest managers that we discussed this issue with would rather have PCT hikers using these already-impacted sites—even the ones that don’t meet LNT standards—just so every hiker is not creating new sites (and trails) all over the forest. In this sense, dismissing LNT is reducing impact. Of course, choose and use these sites at your own discretion. Hopefully, this short guide to camping on the PCT has provided you with some info to help you plan and execute your own PCT adventure, and feel confident in your ability to do it. For more information and descriptions of all the camp areas along the PCT in Oregon, pick up a copy of Hiking the Pacific Crest Trail: Oregon. And a few final suggestions for camping on the PCT: be courteous to your camp neighbors, keep your camp area clean, and pack out all your waste. After all, there are few things more disappointing on the PCT than rolling into a trashy camp area. By being a thoughtful camper, you can have a great experience, and leave a pristine camp for the next hiker to do the same.